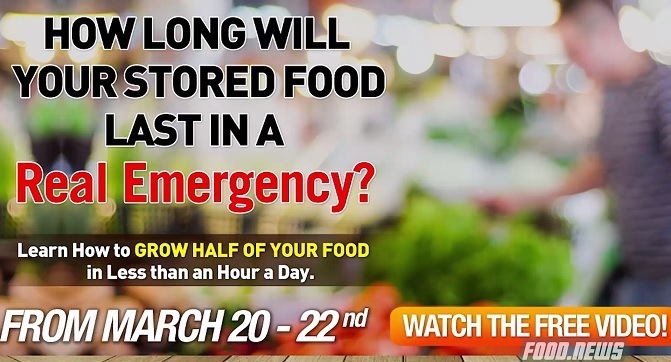 For 72-hours, March 20th - 22nd, 2018, watch the FREE live streaming of the film: “How To Grow Half Of Your Own Food In Your Backyard In Less Than An Hour Per Day.” For 72-hours, March 20th - 22nd, 2018, watch the FREE live streaming of the film: “How To Grow Half Of Your Own Food In Your Backyard In Less Than An Hour Per Day.” Imagine your own supply of deeply nutritious, organic, healthy food that you grew yourself right in your own backyard. Imagine you are free from eating toxic and destructive agribusiness products. Imagine the security of knowing that you have delicious food regardless of what may happen. Fast paced and empowering, this video gets down to the numbers of calories produced, square footage required, and exactly what to do on a daily basis. Focusing on food production with sustainable, organic methods that can be done anywhere – and is especially designed for small spaces. This free 72 hour showing of the video “Grow Half” will empower you learn this 3 part system that everyone from kids to grandparents can put into practice. Start putting home grown food on to your table, and stop worrying about where your food is coming from!